I have long been interested in microscopy and over the years have collected a varied selection of instruments. Some of the photomicrographs shown on these pages were taken through a Watson "Bactil" binocular/monocular (convertible) microscope of about 1954 (the same age as myself! ), fitted with a quadruple nosepiece. This, together with a Zeiss Greenough stereo microscope was the first of my microscope acquisitions. I started out using an old Kodak Instamatic 33 adapted to fit the microscope. With this, it is necessary to produce the image at infinity, (I used to project the image onto the ceiling!) before attaching the camera, as the camera lens is still in place and there is no through the lens viewfinder on the camera and no focus adjustment. Essentially, it is used as a film holder with a shutter. Exposure is by judgment and a little luck! Most of the pictures on this site, however, have been taken with a digital camera, which is a far easier option. No Suitable Phase Contrast Condenser? Not to be confused with Photomicrography, this is the art of making very small photographs, usually on a microscope slide. This was a popular novelty in the 19th Century. Try a drop of lidocaine throat spray -better than benzocaine because benzocaine is not very water soluble, and crystallises, meaning specimens then have to be washed. The original idea comes from Freshwater Microscopy by Garnett, 1953. 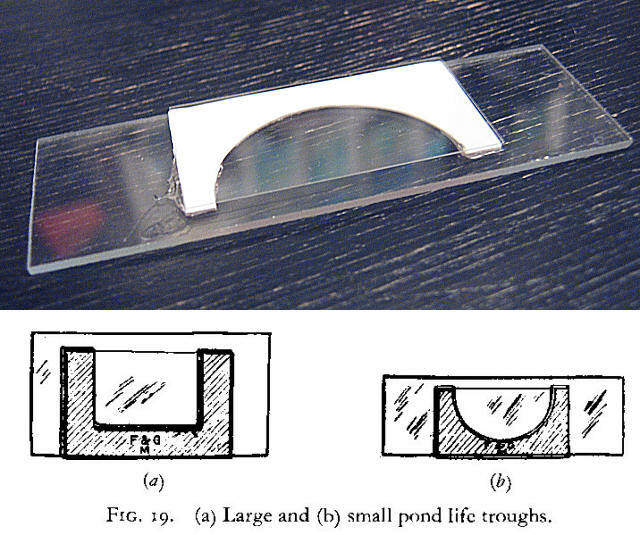 The spacer can be made from polystyrene sheet and glued to the slide. Polystyrene sheet for modelling purposes comes in a range of thicknesses such as 5, 10, 20, 40 thousandths of an inch, hence different depth aquaria can easily be constructed. The sheet can easily be cut to suit the sizes of coverglass available. The coverglass may be held on by capillary action of water alone, or by a smear of vaseline (white soft paraffin) on the top of the spacer. The water will not escape, being held in place by surface tension.